Nowadays, there is no one has the ability to know every batches of Luang Poo Waen's amulets. But if anyone mentions the name of Luang Poo Waen, almost everybody know who is Luang Poo Waen. Collectors of amulets or the common people when talk about Luang Poo Waen's amulets, they will definitely mention Rian Raow Soo or Roon Raow Soo first, because this batch of amulet Rian Raow Soo is the most popular batch of amulet chanted by Luang Poo Waen. Rian Raow Soo Luang Poo Waen, not only is a popular amulet in Thailand, but also the amulet that has the most fakes. 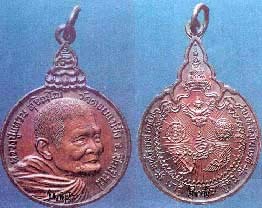 Fake amulets of Rian Raow Soo has up to 1,000000 pieces in circulation in Thailand. Genuine pieces of Rian Raow Soo has about 200,000 pieces only. Rian Raow Soo Luang Poo Waen was created by Samahkom(Welfare Centre) Watsampantawong or Watgoi. This batch of amulet was created for the Thai Soldiers and Thai Police. The name "Raow Soo" means "We Strife". A total of 200,000 pieces were created. Luang Poo Waen chanted this batch of amulet at Wat Doi Mae Pang (Chiangmai) on 1st July BE2520 at 00.21 am. Luang Poo Waen had wished that this Rian Raow Soo to be given to soldiers and police only. As such, after Luang Poo Waen had chanted, this batch of amulet was not easily available outside Wat Doi Mae Pang, unlike other batches of amulets which had been chanted by Luang Poo Waen. Luang Poo Waen had personally given out this batch of amulets to the soldiers and police. After this Rian Raow Soo became popular, there were many fake pieces being created because of demand. Not only in amulet markets or amulet shops, there are fake Rian Raow Soo, in temples also and almost everywhere, there are fakes Rian Raow Soo. Even, there were people received fake Rian Raow Soo from Government Officials also. This batch of amulet has the most fake pieces in the market compare to other batches of amulets. As such, collectors are afraid to collect this batch. Only a few collectors can tell between a real Rian Raow Soo and a fake one, because the fake one looks almost exactly the same.